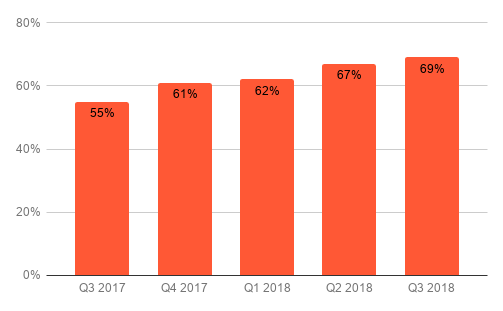 Viewability rates continue to increase quarter over quarter and year over year, an indication that viewability remains an important metric for brands and agencies. Percent of impressions, both viewable and played all the way through. Viewable Completion Rate is a subset of Viewability. 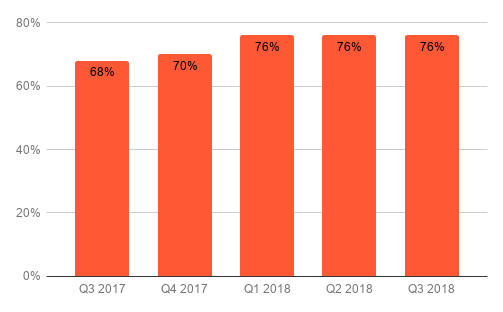 The average Viewable Completion Rate, the proportion of impressions that are both viewable and completed, has remained steady for Q1, Q2 and Q3 of this year at 76%. This is an 11% increase from Q3 2017. 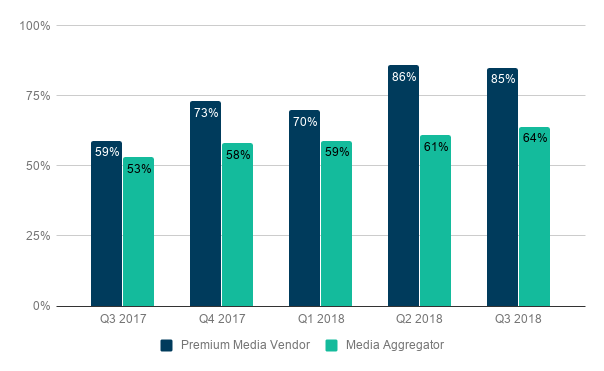 The largest viewability increase year over year was for premium publishers that saw an increase of 44% from Q3 2017 to Q3 2018, reflecting similar gains to those seen in Q2 of this year. Viewability rates for 30-second ads continued to top those of 15-second spots in Q3, but the gap is closing between the two. 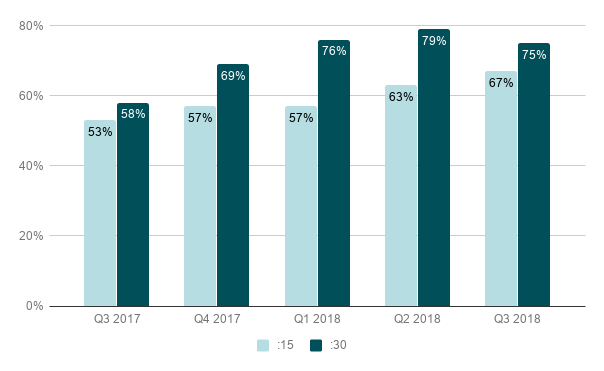 Viewability for 15-second ads saw an increase over Q2 of this year, while the rate for 30-second ads decreased from 79% in Q2 to 75% in Q3. 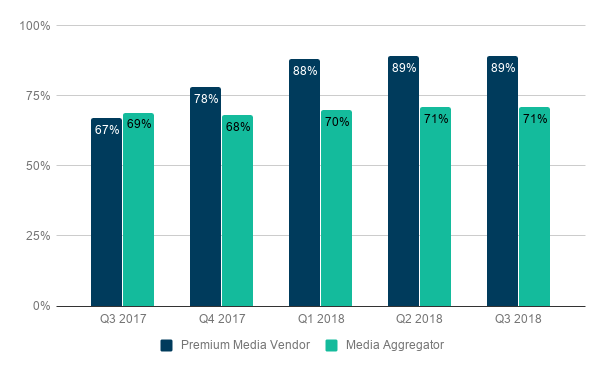 The Viewable Completion Rate for both premium publishers and aggregators remains very steady for the three quarters of 2018 with the rate for premium sites at 89% and aggregators at 71% in Q3. While 30-second ads continue to surpass their 15-second siblings in Viewable Completion Rate, the distance between the two is shortening. 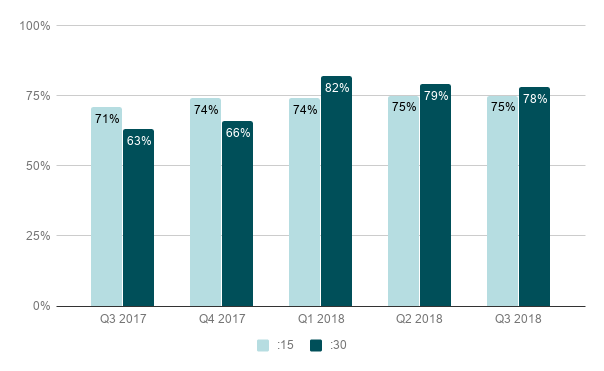 The rate for 30-second ads decreased from 82% in Q1 to 78% in Q3, while the rate for 15-second spots moved from 74% in Q1 to 75% where it held steady for both Q2 and Q3.